In Part 1, Part 2, and Part 3, I covered everything you need to know as to the why, and the how in terms of flies, sinking lines, and technique while fishing still water. In the final installment of the Ripping Streamers series, it’s time to talk about “the swing”. As you already know, streamer fishing is a different animal. It’s not nymphing and it’s not dry fly fishing. We’re offering up a protein-packed meal to hungry and aggressive fish. Big fish. And there’s not a lot of finesse involved. I feel like a gladiator when I’m streamer fishing. And I love that feeling. What exactly is “the swing”? 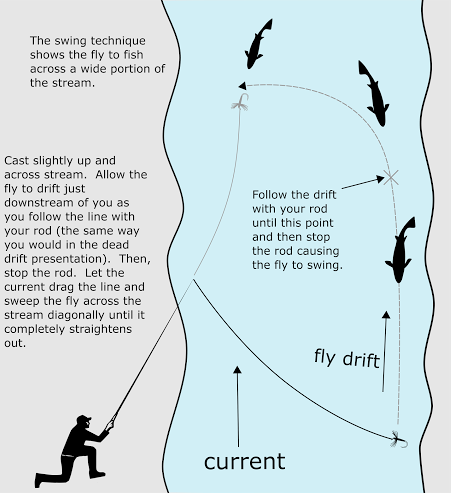 The swing is casting out and into the current so that your flies “swing” around until they drag beneath you. Thus, the swing only applies when fishing moving water. Picture a clock. You cast at 12:00 noon, right in front of you. The river is flowing from 3 o’clock to 9 o’clock, and your cast is over when your line is dragging in the water at 9 o’clock. From 12 to 9 o’clock is your swing. Check out the illustration. 1. Once you’ve found a nice run or deep hole, start at or near the top. 2. Cast across from you or even 45 degrees downstream. Mend your line as necessary, and maybe throw in a twitch here and there if you’re so inclined. You will usually mend upstream. 3. Move downstream. Grid the water like always, but instead of moving upstream like you would with a dry fly or nymph setup, move downstream. You will be catching fish that are downstream from you when you’re swinging most of the time. 4. When you set the hook, use a side set and not a “high noon” kind of set. 5. When you hook up, continue to fight the fish with the rod tip to the side. You want to keep the fish out of the current as much as possible. 6. Be ready. Big and aggressive fish like big meals. And when you hook up, the adrenaline rush will make you feel about like Spartacus going to battle in the arena. If you really want to be a well-rounded fly fisherman, learning how to fish the swing is pretty critical. It also opens up opportunities for fishing salmon, and of course the infamous steelhead. I’ll be writing additional posts on swinging for steelhead as I’m taking a trip to the Great Lakes region to target steelhead later this month. And I can’t wait to go out and do some swingin’! Until next time, may tight lines bring big fish to your net.